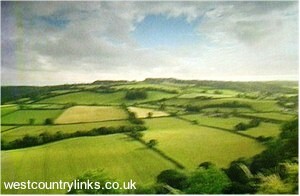 Quantocks Hotels Cottages Caravan Parks Campsites Somerset. The Quantocks are a combination of soft rolling wooded hills, home of the red deer, are to many people the most beautiful part of Somerset. The whole range, including foot hills, extend about 6 by 12 miles to the sea. Unlike the Mendips with the lime stone gorges and underground streams, the Quantocks have gentle slopes fringed by small villages, pastures, heather covered moorland and dark tangled woods, loud with running brooks and dense with flowers providing a variety of attractions for walkers. There are no towns or large villages among the hills this is the realm of hamlets and scattered farms, reached by narrow lanes. Churches, manor houses and cottages are chiefly of red sand stone, which contrasts pleasantly with the green of the surrounding pastures. Sea fishing at Lynmouth, Porlock Weir and Minehead. Freshwater fishing in Exmoor streams on the River Exe at Exford and Dulverton and on the Lyn at Lynmouth.